What are maize prices telling us? In their first production estimates for 2017, the Crop Estimates Committee (CEC) indicated that South Africa could potentially harvest a bumper crop in the 2016/2017 production season. According to the CEC, white and yellow maize are set to increase by 79% to 13,9 million tons in 2017 from the 7,7 million tons harvested in 2016. The prospects of a larger crop indicate that South Africa is likely to have surplus maize for the 2017/2018 marketing season, leaving an even bigger opportunity for exports and a decline in maize prices. From January 2017, the market was hit by lower maize prices. Prior to this, it was widely reported that the possibility of a bigger crop is on the horizon for the upcoming season which was backed up by good rains and excellent crop conditions in some parts of major producing areas in South Africa. It was therefore widely expected that maize prices would normalise after a drought dreaded year which sent prices skyrocketing. To illustrate the maize price movements, we make use of an import and export parity band which indicates the direction prices take with a year of shortage versus a year with a surplus. Import parity is the price a buyer pays or can expect to pay for imported goods and an export parity is the price that a producer gets or can expect to get for its product if exported. South Africa harvested the lowest maize in nine years, resulting in shortage of maize that placed South Africa from a position of net exporter to a net importer. The effect that this had on prices as seen in Figure 1 resulted in higher maize prices, thus causing them to tend towards the import parity band. 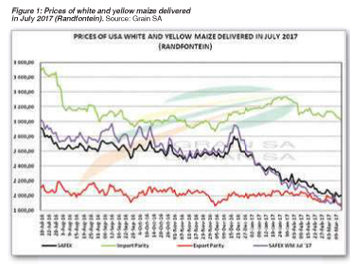 On 18 July 2016, white and yellow maize prices for delivery in July 2017 were trading at R3 018 and R2 912, respectively, which was roughly R800 below import parity; however, towards the beginning of the year, maize prices began to decline amid news that South Africa is likely to harvest a record crop. Safex July 2017 white maize prices decreased since 18 July 2016 to the 4th of March 2017 by 37% while the yellow maize price decreased by 31%. In this case, it is evident that price decreases are largely at the backdrop of expected surplus maize in 2017 harvest. While 2016 was met with low yields and high maize prices; the road ahead looks promising for higher yields but with low maize prices. Lower maize prices could put farmers under strain as they are still recovering from the drought but with potential export opportunities, maize prices could soon show some recovery.